2014 was the first full year of The Political Methodologist‘s on-line blog presence. As we take stock of the year that was, I thought it would be informative for readers and potential submitters (not to mention, ahem, editors) to take a look at how the blog site is doing. I also thought it important for TPM to formally recognize its most popular contributors each year with an award, as a way of expressing the Editorial Staff’s gratitude toward and respect for authors who help to support our Society through practical, high-quality scholarship–even in the newsletter. I am therefore inaugurating the annual TPM Most Viewed Post award for the article published in the previous calendar year that generated the most page views. Because TPM’s blog began at the end of 2013, I’m including all 2013 articles in this year’s award. (I’ll also include all articles published in December for the next year’s award on an ongoing basis, as it’s a bit of a raw deal to be published on December 31st and have just one day to generate page views to be counted toward an award.) This award entitles the recipient to a line on his or her curriculum vitae, and one (1) high-five from the incumbent TPM editor (to be collected at the next annual meeting of the Society for Political Methodology). Pretty good! The site had 43,924 page views and 29,562 unique viewers in 2014. 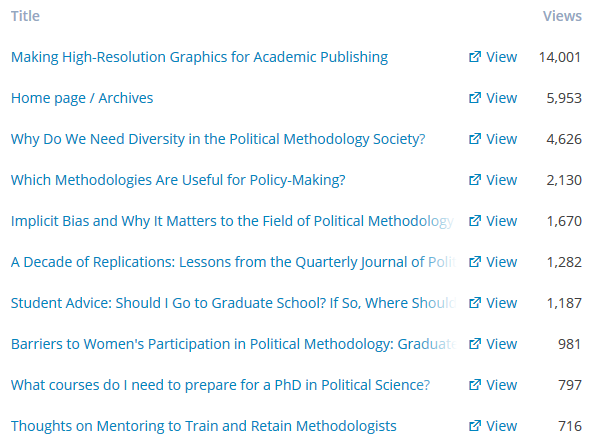 I don’t think we’re in any danger of putting Science out of business, but I think that’s an excellent readership base for the newsletter of the Society for Political Methodology. I look forward to bettering these numbers in the year to come, with the help of new and interesting contributed posts! Now, let’s look at the top ten most-viewed posts in 2014. These statistics count page views in calendar year 2014 only, but all-time viewing statistics leave the same two posts in the same order at the top of the rankings. Thomas Leeper‘s post on making high-resolution graphics is, by a factor of nearly three, the most viewed article in TPM for 2014. You’ll note that it’s viewed even more often than the home page; this is likely a reflection of the fact that visitors reach the page by Googling for help making high-resolution graphics and then finding Thomas’s article. So, by the power vested in me by WordPress, I award Dr. Thomas J. Leeper The Political Methodologist Most Viewed Post Award for 2014. Congratulations! The runner-up is Chris Achen‘s post on diversity in the Society for Political Methodology. I’m pleased to see this topic attracting such a great deal of positive attention from our readers, and I hope that this attention foreshadows improved diversity in our ranks in the future. Last, an editorial message: Royce Carroll is departing as Associate Editor, leaving Rick Wilson and Randy Stevenson as the Associate Editors and me (Justin Esarey) as Editor. Thanks to Royce for his assistance as The Political Methodologist launched its blog! A low-five may be substituted upon request. This entry was posted in Editorial Message, The Discipline and tagged Editorial Message. Bookmark the permalink.